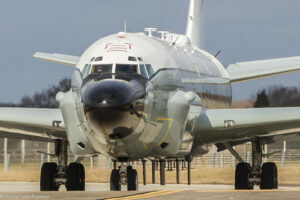 Designed to provide real time surveillance and analysis to personnel in the air and on the ground, Project Airseeker, based at RAF Waddington, uses Boeing RC-135V/W Rivet Joint aircraft to gather data and vital intelligence. While it’s the new aircraft that have grabbed the headlines, the associated ground support structure for Project Airseeker is equally important in terms of maximising the effectiveness of this investment. To that end, the Defence Infrastructure Organisation (DIO) made it a priority to provide new facilities at RAF Waddington, including a maintenance and storage hangar, alongside a newly constructed annex to house administrative and training functions, as well as accommodation space. The maintenance hangar is designed to service and maintain the aircraft and safety within this environment is of paramount importance. In any environment with flammable materials, a fire detection and evacuation system is vital in order to keep people, property and assets safe. The DIO made contact with TecservUK to hear its recommendations. TecservUK was charged with specifying and configuring two separate fire detection systems – one for the hangar and another for the annex. Following a site survey, products from Morley-IAS by Honeywell were chosen. Equally suited for the hangar was the Honeywell FAAST LT aspirating smoke detection system. In order to cover an area over 15m high, the solution comprises of an enclosure, which houses the electronics that are powered from a supply, and a fan inside it that draws air in via sampling pipes that are connected to the unit. The air goes into an aspirating chamber and across a laser beam– if sufficient smoke particles are detected, an alarm condition will be activated. Servicing of the system is also easier because it can be conducted at ground level, as opposed to using overhead smoke detectors which would entail the use of ladders and poles. As well as a wide range of call points, communication modules, isolators and enclosures, optical smoke detectors were used in both locations. By using the light scatter principle, they are ideal for applications where slow-burning or smouldering fires are possible and, when combined with ultraviolet/infrared flame detectors and a video smoke detection system, every possible eventuality has been covered.